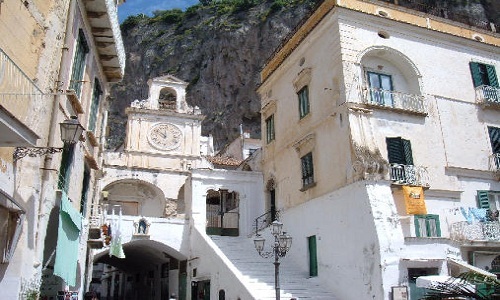 Many believe Atrani to be a fraction of Amalfi, it only takes a short stop before the tunnel that separates the two villages, to understand that the town is a universe unto itself. 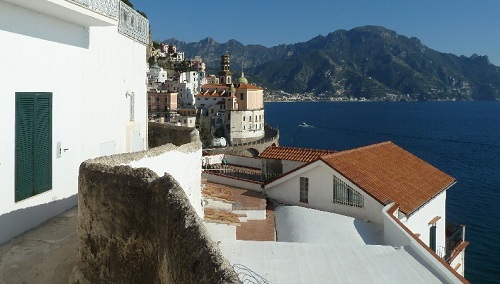 Atrani is situated between sheer cliffs and the turquoise crystalline sea, near the so-called Valley of the Dragon. Still quiet and picturesque, its winding streets have remained largely unchanged. 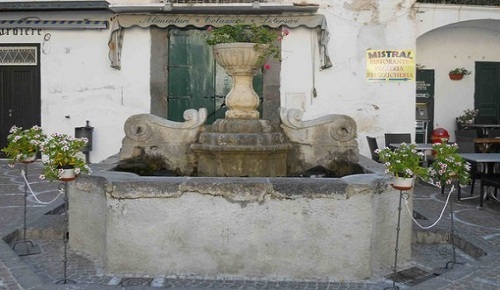 It is located less then one km from Amalfi in the province of Salerno and the only town along the coast to preserve intact its antique, traditional characteristics. 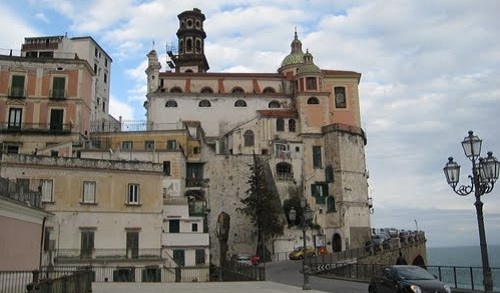 Atrani, like all the other towns of the Amalfi Coast, was the residence of noble Roman patricians, evidenced by the sumptuous villas that archeological excavations are bringing to light. It was mentioned for the first time in a letter of Pope Gregory the Great, in 596. The territory was more extensive than the current border and protected by massive fortifications. 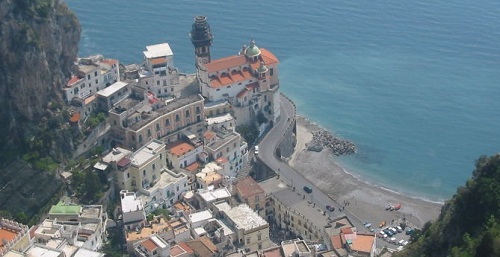 The tsunami of 24 September 1343 submerged much of the coastline and put an end to the splendor of Amalfi and Atrani, already tested by the continuous incursions of Pisa 1135 -37. In the years that followed, the fate of Atrani and Amalfi, whose duchy, now lapsed, was incorporated in the Principality of Salerno. 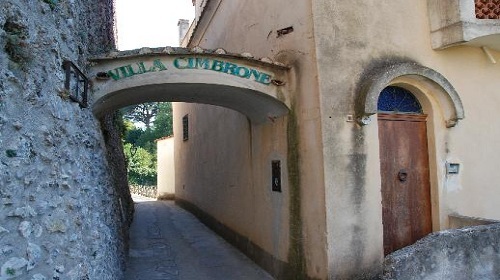 There are no certain traces about the origins of the town's name: according to some, in fact, it derives from the Latin word "atrum" (dark, with reference to its particular geographical location), according to others from an ancient Greek settlement (Atranes). 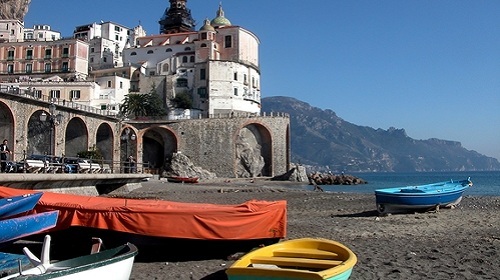 Atrani, today, maintains it's distinct fishermen's town atmosphere. The houses are all painted in pale colors, in perfect harmony with the surrounding landscape, and can be reached by various flights of steps and narrow alleyways. 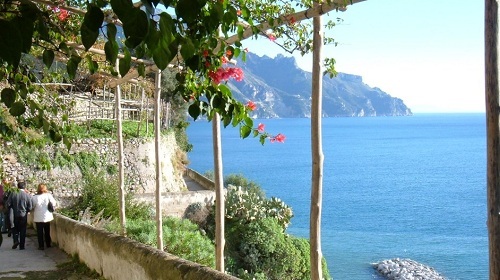 The main entrance to the town starts from the beach, and from there, the traditional houses climb up the steep mountain valley, intertwined with gardens, and vibrant lemon terraces. 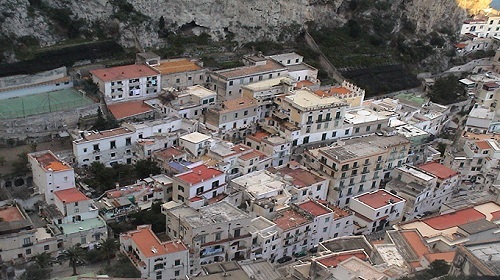 From an urban point of view, Atrani preserves a typical medieval town structure with narrow streets and alleys, mostly covered by vaults and arches, which wedge among the houses and then intersect in a square or in a wide stretch. Real vital center of the village is the square, meeting place and entertainment. 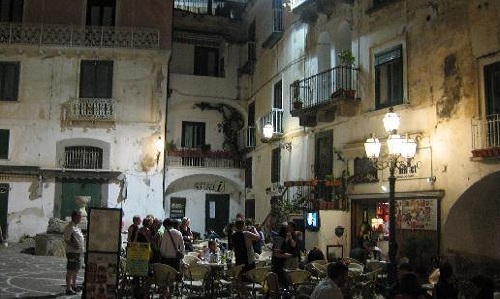 Piazzetta Umberto I, few steps from the beach is surrounded by a typical block of houses, the town's square hip atmosphere and architectural details make it one of the most attractive open-air venues in this part of Italy. The small beach, adorned with boats and fishing nets in low season, becomes, in summer, a meeting place for young people of all nationalities. 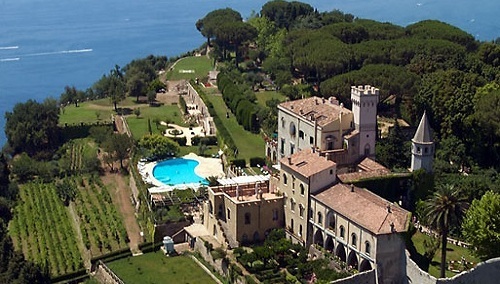 For tourists and visitors to the discovery of the gentle landscape is interwoven with the testimony of history. 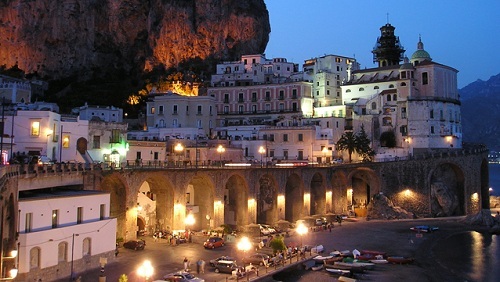 Atrani continues its ancient agricultural traditions, with its small vegetable gardens and fruit orchards where typical products of the Amalfi coast are grown: aubergines, tomatoes, walnuts, olives, citrus and other fruits. Church of San Salvatore de' Birecto, built in the X century with a square plan and preceded by an elegant portico. The current façade with the clock and the spectacular staircase was designed during the Baroque period. At the time of the ancient Marine Republic of Amalfi it served as Palatine Chapel: here, in fact, the Doges were elected, crowned and buried. Collegiate Church of Santa Maria Maddalena, built in the XIII century on the ruins of an ancient medieval fortress as a vote to thank the Saint for having liberated the area from the Saracen occupation. Rebuilt several times in later centuries, at present it features a Baroque style, with an elegant glazed dome and a square bell tower in dark tufa. Inside important paintings are preserved, including "L'incredulità di San Tommaso", masterpiece of the artist of Salerno, Andrea Sabatini, and valuable sculptures. The small Church of the Immaculate, adjacent to the Church of San Salvatore de' Birecto and the Church of the Madonna del Carmine, built in the early XVII century, features a simple façade flanked by a fine bell tower in Moorish style. The interior, characterised by one nave plan with decorated marble floors, preserves an organ with a wooden balcony, a XV century fresco depicting the Madonna on the main altar and, during the Christmas period, it features an XVIII century nativity scene, whose shepherds are a faithful reproduction of the inhabitants of Atrani, at the time when the statuettes were commissioned. 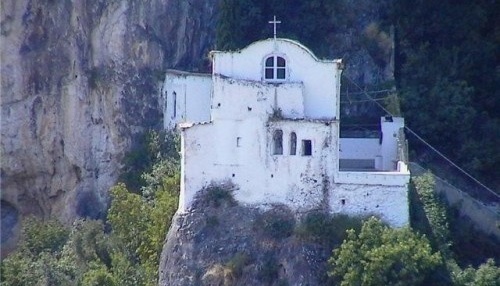 The Church of Santa Maria del Bando, built in the X century on top of Mount Aureo, under the Torre dello Ziro. The name derives, according to local traditions, to the fact that the Virgin Mary granted the grace of a man unjustly condemned to be hanged, an event depicted in the XV century fresco surmounted on the altar. For the historians, instead, the name derives from the fact that here, in the Republican period, edicts and judgments were proclaimed. Inside a Roman burial urn is preserved. The Church of San Michele Arcangelo (XI-XII century), built in a cavity of Mount Civita and used as a cemetery until 1927. 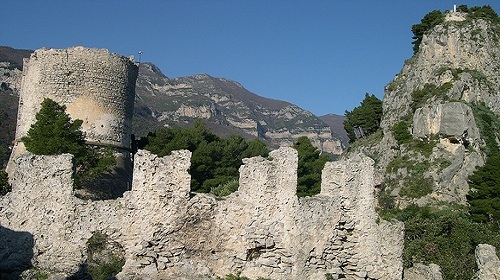 Masaniello's Cave on the eastern slope of Mount Aureo, where the famous popular leader (Tommaso Aniello d'Amalfi) sheltered, after the Neapolitan insurrection against the Spanish Government in 1647. The mother's home of the famous revolutionary was historically situated not too far from the cave. The Grotto of the Saints, not far from the Torre dello Ziro, decorated with frescoes in Byzantine style. This is all that remains of the ancient Benedictine monastery, entitled to the Saints Quirico and Giulitta, founded by Archbishop Leone I in 986.